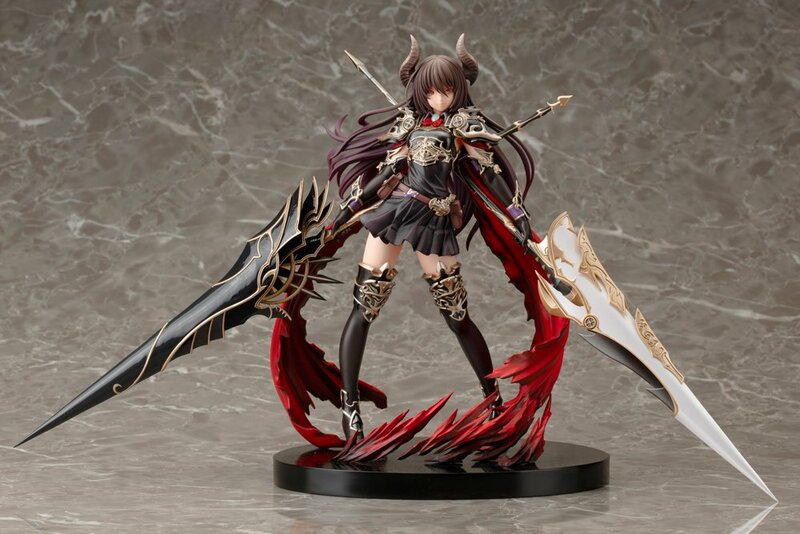 Rage Bahamut Dark Dragoon Forte is a Must Have Figure! Yeah, Rage Bahamut Dark Dragoon Forte is amazing. Just like the other Rage of Bahamut figures, she is really detailed. I especially love the sculpt of the clothing on this one. She is made by Kotobukiya and stands at 1/8th scale. She has great detail on the horns, her swords, clothing, armor, and just about everything. The Rage of Bahamut game isn’t actually available anymore but, you can find the Rage Bahamut Dark Dragoon Forte figure right here! Let’s look at the colors on Rage Bahamut Forte! I love the hue shift in the hair. It changes from a dark brownish color to a lighter purple at the tips. It looks awesome. Her horns also have a cool hue shift effect as well. They start from the bottom as a deep brownish color and move towards a light gray. The cape on her looks really cool. It’s like two mini capes and they stand out in a bright red. Her cape pops out compared to the colors of the rest of the figure. I love the amount of detail on the figure, all of the folds on her clothing and cape, and the great paint job on the armor. Her skirt has a great sculpt to it with the all of the billowing folds. All of this paired with the dynamic contrapposto stance make for a great figure. Weapons always look awesome on figures! I love the two swords. They are bigger than she is! There is some minor assembly on attaching the swords but, it’s really easy. However to be honest it’s probably not even worth mentioning. It is worth mentioning though that you can’t remove the swords because they are already in her hands. You just clip the actual blades of the swords onto the handles. I dislike the base, it’s just very simple. Sure, it has some of her cape sticking out of it but otherwise, it’s quite plain. Is it worth getting Rage Bahamut Dragoon Forte? Yes! I’m not too familiar with the source material of this figure. Rage of Bahamut is the game she’s from. It seemed to be pretty popular. This figure is still worth getting just for the cool factor alone though. Overall Rage Bahamut Dark Dragoon Forte is very well made! In fact, if you’re a huge fan of the Rage of Bahamut characters, you may want to check out Dark Angel Olivia and Little Queen Vania.